Sea, Sand & Sky: Thomas White has found his lucky marble; It’s time for you to find yours! Thomas White has found his lucky marble; It’s time for you to find yours! Congratulations to the second winner of the “Simply Marble-ous” Treasure Hunt, Thomas White! 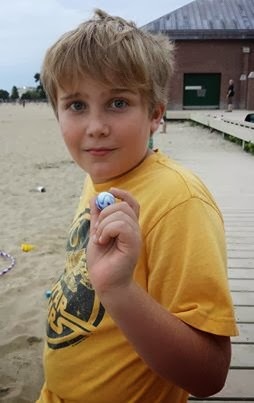 With the help of his father, Langdon White, Thomas found his lucky marble on the L Street Beach in South Boston. The White family participated in this contest last year when they found their first marble. Their hard work and treasure hunting skills are now being rewarded with a roundtrip ticket from JetBlue Airways to any domestic destination from Boston’s Logan Airport. This is the second year that Save the Harbor and JetBlue Airways partnered to celebrate Boston Harbor and the region’s great public beaches with the “Simply Marble-ous” Treasure Hunt. The contest began in 2012 when more than 100 people came out for a beach clean up. Together they did 5 weeks of work in just a few hours. At the end of the day, the participants released marbles into the water for the first time. While everyone wants to win a free flight, the real heart of this contest is providing the community with clean public beaches for work and play. More than 200 marbles are still waiting for you to find on Boston area beaches in Lynn, Nahant, Revere, Winthrop, East Boston, South Boston, Dorchester, Quincy and Hull, so keep hunting! Find one and you could win your own roundtrip ticket to any domestic destination courtesy of JetBlue Airways. It is free and easy to enter the "Simply Marble-ous" Treasure Hunt. When you find a marble, just post a picture of yourself with the marble on Save the Harbor’s Facebook page at www.facebook.com/savetheharbor or email your photo and contact information to info@savetheharbor.org. Can’t find a marble, but still want to have the opportunity to be entered into the contest? Make an online contribution at http://savetheharbor.org/contribution.html of any amount to Save the Harbor/Save the Bay and you will be entered. The next winner will be chosen this week! Winners will be announced on our Facebook page at www.facebook.com/savetheharbor so stay tuned!